Is anything really random? Is a gift ever free? What does it really mean to be generous? Isn’t there a return encoded into most gift in some form, and isn’t this the natural way of things, to enable human beings to exchange and reciprocate? These are the questions arising, some of which have been on my agenda for a while and some, which have yet to be fully explored. They were the starting point for my ‘Random Acts of Generosity’, a gentle intervention happening in the corner of the gallery on Saturday 12th, which may turn into something more. I tried to make the exchange (the participant’s time and attention in exchange for a gift, and my own attention to the subject) as equivocal and containing elements of the ‘random’ a possible. But, as always, there were so many synchronous elements – both in the questions raised, the stories shared and the nature of the precise object received, that it took on its own life. That’ s the thing about dialogical work, you never quite know who will turn up and what they have going on, and how what you have to offer will land. Also, although ultimately I was the one holding the unwrapped gifts in hand and the questions, I hold some control, it is only in the receptivity and presence of the other that the work can actually exist. It has to be reciprocal, and born of the moment. I had a list of question, quotes, thoughts and personal stories on the above themes, listed A-Q, and asked them to pick a number at random, this became the starting point for a short exchange. A gift is defined as something that enriches, ‘given without expectation of return. A thing given willingly to someone without payment; a present. A natural ability or talent’. Unpicking what a gift actually is with people, always brings up what it isn’t. i.e., are many so-called gifts simply unspoken obligations in disguise? In our society, much giving has become associated with losing or profiting and the measuring of what is given or received, an unspoken tallying system, and so debt has become so dominant on all levels – which always brings me full circle to The Book of Debts when this comes up. So some of the stories entered that day into The Book were a result of a conversation about gift, and as debt seems to be presenting itself as the darker sibling to gift, this completes an invisible circle in my head and makes me realise how interconnected everything I have been working on since I created my earlier gift- based works. I’m not going to reveal in detail what I gave people, or even what happened between us, as that seems to be giving too much away for now but let’s just say it was a mixture of objects with suggested instructions, all of which were versions of gifts – whether intentionally given to me or experienced as a gift in my life – which I had received at some point. I have to say, although there were only 14 slots, I could have given away a great deal more, as once people notice there is something being given away, wrapped in a brown paper package with a label attached, curiosity is piqued. Wur Blog a collective blog on gift, exchange and reciprocity initiated and hosted by fellow AN blogger and artist gifted in the art of generosity as a practice Jean McEwan. 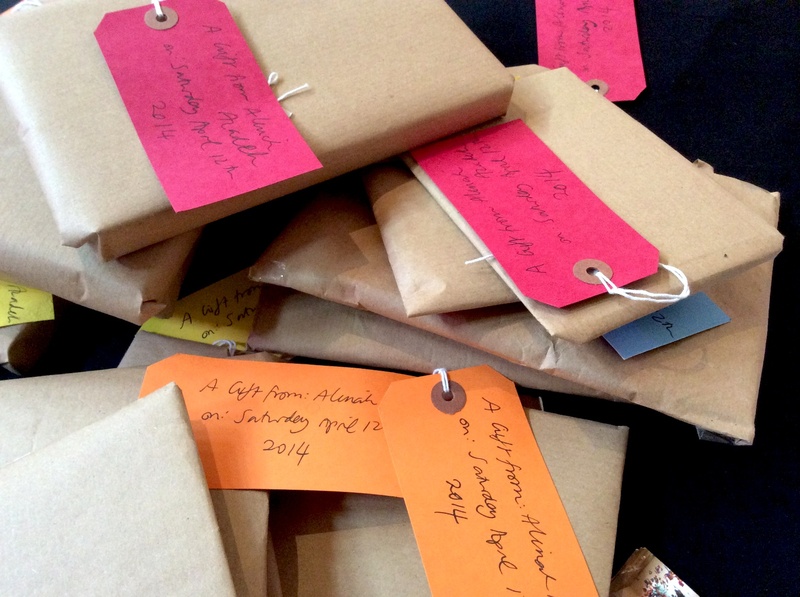 And Giving into Gift by Tim Jeeves, birthplace of Burning The Books (look under Present in Public, 2011). It is ongoing and Tim is pioneering in his approach to engaging artists and public in gift in a whole spectrum of ways. It is ‘ a meeting point between artists, their peers and the public, Giving in to Gift is an ongoing conversation around ideas of generosity and reciprocation and how these themes manifest. It’s an examination of the contradictions present in the giving of gifts, an enquiry into how they interact with the changing economic landscape, and an opportunity for differing modes of collaboration to be explored. I’m next out with The Book of Debts (which is filling steadily, check some of the entries online here) at Hove Museum on Thurs May 8th 2-4pm. If you come and see me, I will offer you a free cup of tea, in return for your attention to the subject of debt, the shadow side of gift, in all its dark glory and transformative potential. I’ll also be in conversation with French artist Samuel Rousseau 7-8pm on the same day, May 8th, at Fabrica, on the subject of art and social change – details here. A really interesting read, and am disappointed I was at the wrong of the country to come see. Thinking on the return gift often makes me go back to David Graeber’s comments in ‘Debt: The first 5000 years’ on how the tendency we have to view all human interactions as exchange is deeply ideological, and is only really as old as Adam Smith’s Wealth of Nations. I’m particularly struck by what he calls ‘baseline communism’ (I think that’s what he called it) – the passing of salt, the giving of directions, the helping a child that has fallen on the railway line – as a way of starting to think around that. Hi Tim, only just seen your comment must find the notification swithc!) Graeber’s book is an extraordinary one isn’t, am still digesting /reading it two years later.. The compulsion to reciprocate, whether it is culturally conditioned or not, still feels like a primal one tho, when it’s coming my way, (I can only speak for myself and observe how others respond to me giving them things without expectation of return) but I know he questions this in great depth… I can’t get away from what Margaret Atwood explores in her Payback: Debt and The Shadow Side of Wealth by mining (pre-christian) ancient myth and legend around this idea that we live as if there is an underlying balancing principle in the universe, according to which we should act’ and this accounts for both the psychology of the debtor /creditor (all debts must be repaid, no matter what) as well as the giver/giftee (all gifts must be reciprocated, not necessarily in kind but in other ways. I cant believe I worked with gift so long without exploring debt! I think you’re right – going back to Newton’s ‘For every action there’s an equal and opposite reaction’ some kind of return does seem enforced on a level outside of culture. Yet I also think Graeber’s really onto something in terms of the ideological influence on how we conceive this. Recently, I’ve been thinking about the difference between gratitude and debt. How debt demands a return and leaves the debtee in an unpleasant place until it is paid (and often even after), but gratitude – although the return that is made could be identical in form to the repaid debt – is freely given, and to feel grateful is normally joyful. hi Alinah, I saw this when I’d just posted on Charles Eisenstein’s idea that acts of generosity can disrupt the old story. I am just putting my big toe into the idea of gift, and I hadn’t really found a way to connect that to my art directly, can’t quite make the jump after 40 years of professional work. Anyway, I’m so glad I found this and will link right away to the article I just wrote on tendingtime. Hi Sarah, glad you stumbled apon some useful thoughts…on the subject of disrupting the old story, i am finding that asking the question ‘what do you owe /are you owed?’ is a major disruption to the story of shame, secrecy, separation and stigma encoded into the human psyche around debt and this is true of my own relationship to it too. But what keeps me on track is the network of common narratives around it, ( a form of Interbeing, as CE defines it) that, once surfaced and made public in a poetic context (the reciting and burning of the book of debts) allow a questioning of its very power and sometimes legtimacy..About to write more on this in my next post. Good luck with your journey into gift, i will keep tabs on your blog..
thanks Alinah, this is a fascinating topic, one I’d not given thought of before. I’m following your blog, I am sure it will bring richness and insight into my own explorations of art, gift and the time between stories. Tout n’est pas Perdu – installed! Sarah Zoutewelle-Mor… on Amiens, on arrive!